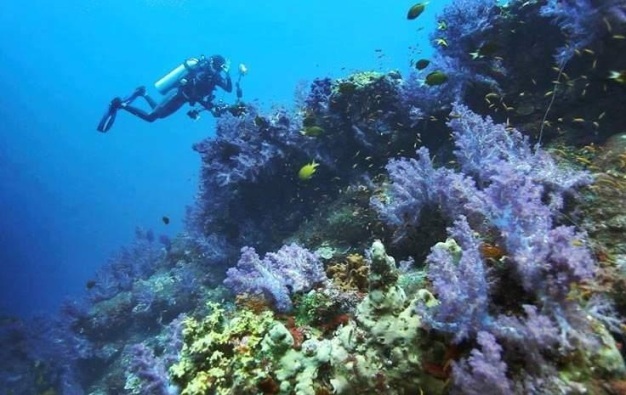 Barren Island, one of the most easterly of the Andaman Islands in the Indian ocean, has turned out to be a major new revelation for incredible scuba diving. 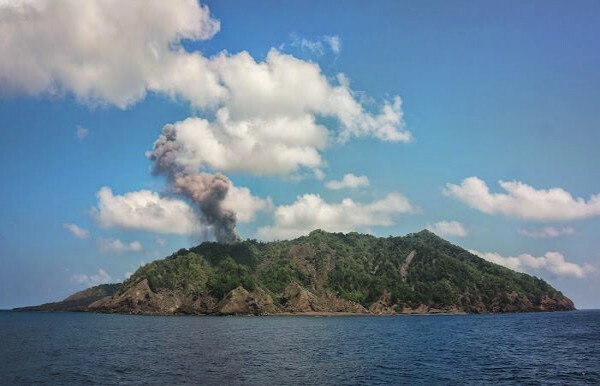 Barren Island has the only active volcano in South Asia and the volcano has been erupting regularly. The smoking volcano out in the middle of the ocean itself is an imposing sight to behold, and the surrounding waters make for some of the best diving in the world today with crystal clear visibility. This jewel of an island was very difficult to get to in the past, but now the Infiniti Live-aboard operates trips here between February and May every year and is an excellent option. Description: Who needs narcotics to get high when we have our very own purple haze? The dive starts off at a very gothic, wave lashed and naturally carved cathedral like structure leading into a submerged cave that’s around 4mts. The beautiful rock structures look like they were sculpted by aliens. And the boulders are coated with patches of multicolored fluorescent coral. On exit from the cave, there’s an offering of a skeletal tree placed strategically on the edge of the ledge. To the right is the stone wall with a story to tell for every crack and crevasse. The wall runs deep into the dark, adorned by shimmering giant white Gorgonians. Gently drifting along, you come upon two ridges and all around there’s nothing but a brilliant purple hue, thanks to the soft purple corals. They stretch far and wide to almost 50mts in all directions- up, down, left, right, as far as the eye can see. The ridge is the hangout of a friendly curious turtle. And visiting him are the manta rays and the occasional white tip reef shark. Our last visit saw an inquisitive blue marlin of 2m. 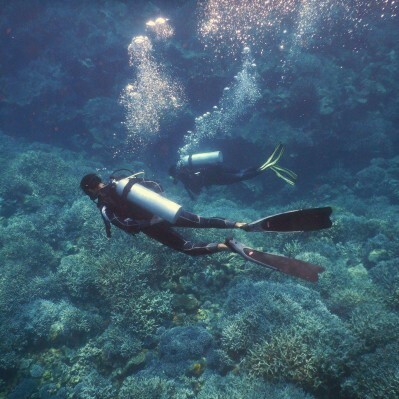 If the currents are strong and push away from the reef, then drift out away into the blue at the end of your dive for your safety stop. 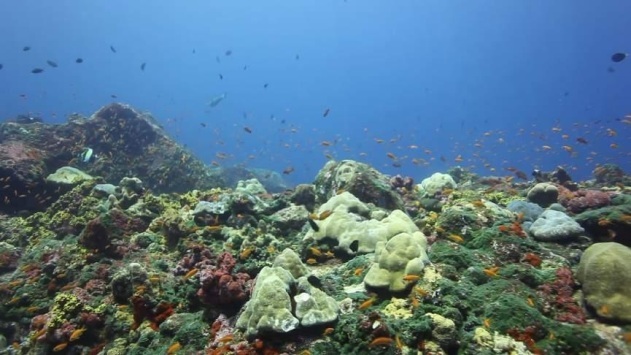 Description: What’s interesting about getting to this dive site is that you may see the Barren peak smoking away to glory with it’s main lava flow running down it’s shoulders into the sea, where it turns into a reef. The dive starts at the beginning of the lava flow. Mantas can even be spotted from the surface. The dive is done keeping the reef to the right. The top of the reef is a cleaning station where the mantas and other fish drop in. It’s a happening hangout place with current sometimes. The sides are decorated by fans and the end of the reef is marked by a wall of stones. Going up the stony shoulder is a path that is looked down by huge rocks on either sides. It leads to one of the most mesmerizing places ever (wait for it ;) ). Look out for the needle fish. They swim by the dozens. Description: Continuing up the stony path from manta point, you get caught off-guard by shimmers on your face. You look up and find yourself staring at rich coral growth all around. This spectacular collection is made up of all sizes of fast-growing cabbage and salad coral, the sides and the floor are covered by white and brown staghorn coral, with their blue tips indicating healthy growth. In between them are the tiny fish, busy visiting one coral to the next, saying hello to their kin. There’s a parrotfish chomping off on a coral, a puffer passing by, and the rainbow glass fish shining away brilliantly as the rays fall on them. You’ll lose yourself there. It’s paradise. And all this at a depth no more that 7m! Any one snorkelling here will want to become a diver in no time, guaranteed. 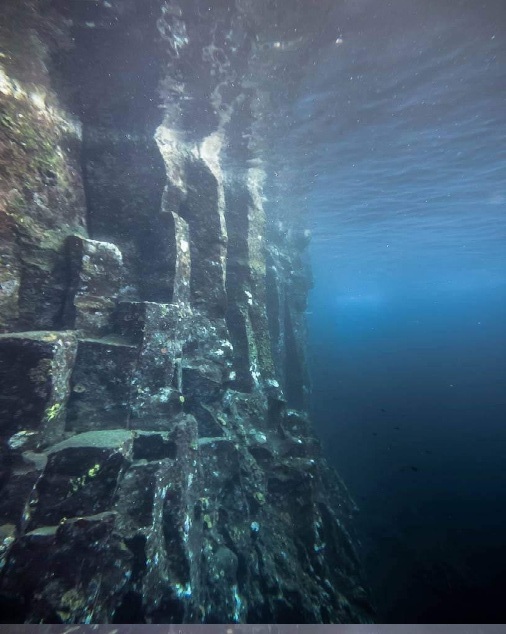 Description: Starts off as along a wall diving, with similar stone structures that mark the underwater landscapes at Barren Island. All around these rocks is plenty of fish life and coral growth. At the curve, we hit the reef which has even more coral growth. The top of the reef which is 8m-15m deep showcases a carpet of the most beautiful fluorescent colors of coral, feather stars and of course the great white gorgonian fans. The downward current here more often than not tends to get so strong that holding on to a rock is necessary in order to not get swept off. 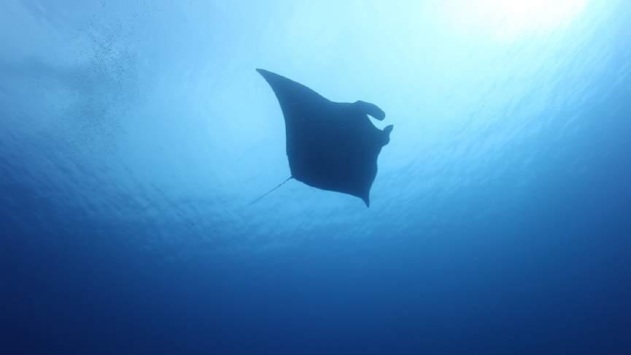 Manta sightings often happen at this site, swooping in from the deep blue. 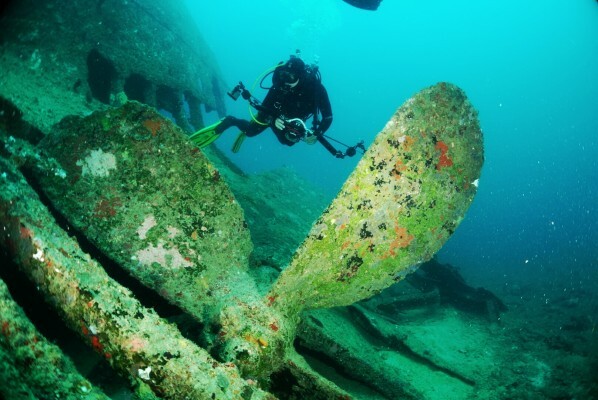 Peculiar feature of this site is that fans grow and spread themselves out in a direction perpendicular to the current, to maximize trapping of plankton a food source as well as sunlight as an energy provider. Keep a watch out for the topsy-turvy current. Description: Just off the unique black sand beach of Barren Island. 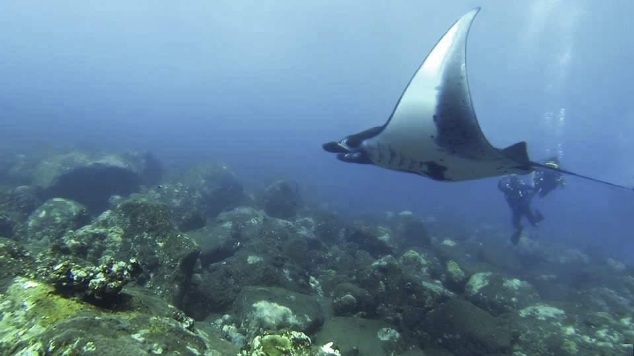 There is a family of up to 9 mantas frequenting this area. In-between the stag-horn coral and fluorescent coral can be found the brown-spotted coral crabs trying to catch the tiny fish that swim in and out of the coral. Blennies look at you with their wonder filled big eyes. The landscape here is scattered with rocks an each rock is a mini-marine system by itself. In the night you’ll often spot octopus, lobsters and big crabs out of their sheltered rock and sharks feeding-if you are at the right moment at the right place. A couple of Clark’s anemone fish can be found here. On a general note, its black sandy patches with rocks all around as activity centers. The black sand that originates as lava is heavy, settling on the ground quickly and filtering the waters clear and blue. Description: As the name suggests, the gallery is stony labyrinth of chiseled rock in column formation that is a super backdrop for a rock concert. It’s main feature are the rocks in the step-like formation, where one can sit and take group photos. Ideal to dive during high tide. Near the auditorium is an over-hang that’s covered by rich soft coral growth. Recommended to take torches even during the day because it tends to get dark in the overhang due the barricading of light. Beyond this is a cave and just past the cave is a ledge with lush fan growth and life similar to manta point reef. It makes for an easy relaxed dive because of the absence of current. 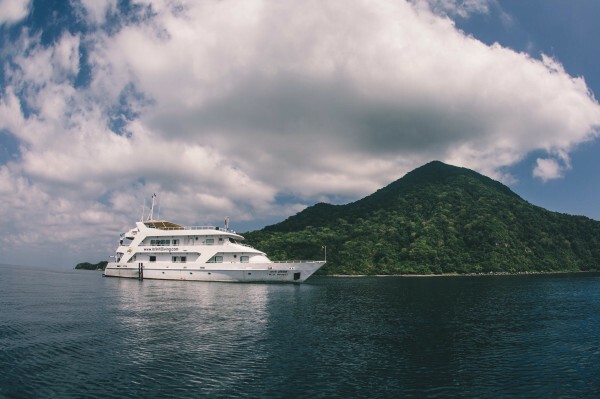 The Infiniti Live-aboard organizes diving trips to Barren Island from February to April. The live-aboard trips are guided and catered. The live-aboard features spacious guest staterooms, air-conditioning. Trips start from Port Blair which is also the airport entry and exit point in the Andaman Islands. Take a flight to Port Blair from either Kolkata or Chennai in mainland India (Several good flights daily).